Included in the entry fee is nutrition at the refreshment stations, as well as fruits, energy drinks, chocolate and water that runners can enjoy straight after the race. Other nutrition is not included in the entry fee. 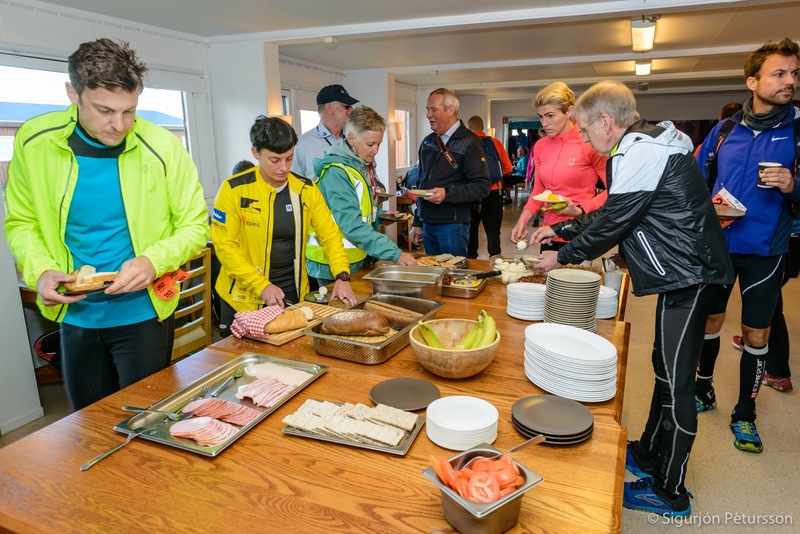 Participants are offered to order breakfast in Hrauneyjar as well as dinner after the race in Husadalur, Thorsmork, for themselves as well as their family and friends. Food ordering has to be finished no later than on July 1st. The food should be ordered by the participants at the runner's page, "Your Page". All the buses will stop for 30 minutes in Hrauneyjar. A breakfast buffet will be available for those who have booked it at "Your Page" before July 1st. The breakfast buffet includes bread, toppings, juice, coffee, tea etc. Breakfast should be paid when picking up the race package on July 11th-12th. The prize is 1.300 ISK. The Volcano Huts are the service provider at Husadalur in Thorsmork and they will offer runners to buy warm meal after the race. It is possible to choose between a meat meal or vegetarian lasagna. Drinks with the warm meal are offered by the company CCEP (Coca Cola Iceland). All beverages available for participants during the race are also provided by CCEP Iceland. The price for the warm meal is 3.600 ISK per. / person if booked at "Your Page" before July 1st. Those who decide to join the others for dinner on race day will be paying full price, 4.700 ISK. It is possible to get 50% discount (2.350 ISK) for children 14 years and younger in Thorsmork. Children's tickets cannot be pre-booked. Those who have purchased food will receive it upon submission of a food ticket or a participation bracelet. Tents put up by the Laugavegur staff are for participants only but not their guests. Those who are going to dine with family and friends are advised to do so in the house of the Volcano huts.